A few months ago, I saw this pretty pin. I was in love with the simplicity of it and knew I wanted to create something of my own. 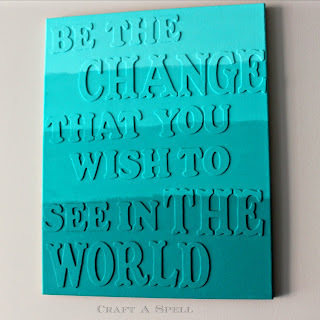 I found a quote that I loved by Mahatma Ghandi. 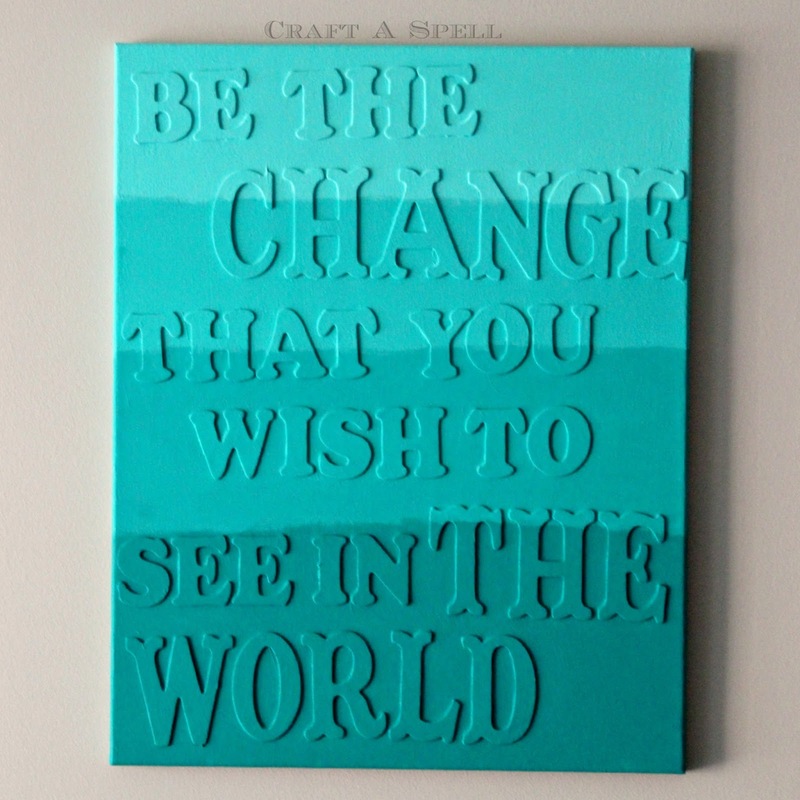 "Be the change that you wish to see in the world." 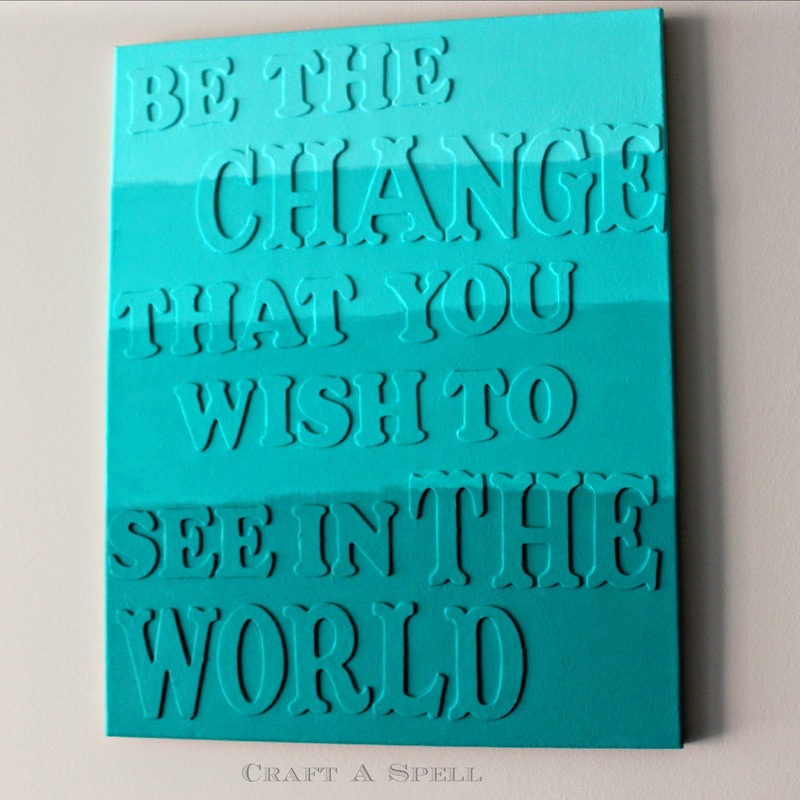 I knew I wanted to make it into a double quote so that CHANGE THE WORLD would be featured. I came up with this and oh was it a journey to get there. You may be surprised to see that I had originally painted the canvas this hot pink. My living/dining area has reoccurring hot pink/turquoise accents. I already had the blue in my herringbone art in the dining room section so I wanted pink in the living room. I then painted the edges of the letters in black and gold. I thought maybe you'd be able to see it stand out. 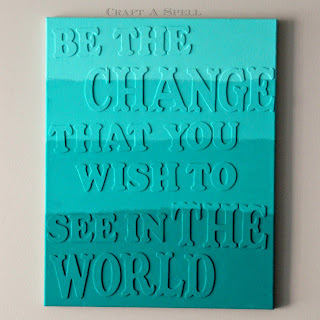 The bigger words (CHANGE THE WORLD) got gold and the smaller words (BE THE THAT YOU WISH TO SEE IN) got black. Looking back now, I should never have done this but this is a journey and we can't get to the end without going through the beginning. I organized my letters on the canvas and placed them exactly where I wanted them to go. Then I hot glued them on and painted them pink too. In my head, this was as far as I knew I wanted to go from my planning stages. I knew I didn't just want it to be hot pink but I didn't know what else to do. So I started painting. First I did a thinly brushed gold layer over it, thinking it would look really nice. It didn't. So I threw some white on there. Then light pink, purple, and hot pink. That was all too busy so I dabbed copper on top. Before I knew it, it ended up like this. Shield your eyes. I hated it. I sat on it over night (not literally) and hung it up on the wall so I could see it throughout a day's worth of light. Maybe it would grow on me. It didn't. I decided I needed to start over so I painted it white. I went back to the original pin and realized that what I loved about it was the simplicity of it. I needed to stop denying to myself that blue is my favorite color and I'm allowed to have a lot of it if I want. I felt like I was forcing the pink just because I wanted a different color. I went back to teal which I am loving so much right now. I'm not a huge fan of ombre but I decided to give it a try. I started at the bottom in the original teal color. Then I added a bit of white and did the next section, making sure I got all around the letters. I always mixed enough for the two coats because I knew I'd never be able to recreate it. I came out with this. This is one of those projects that just reassures me that I should never give up. I love it! Here is a close up of the ombre. I made sure to do the sides of the canvas too because you get side views. I think this art really encompasses me. 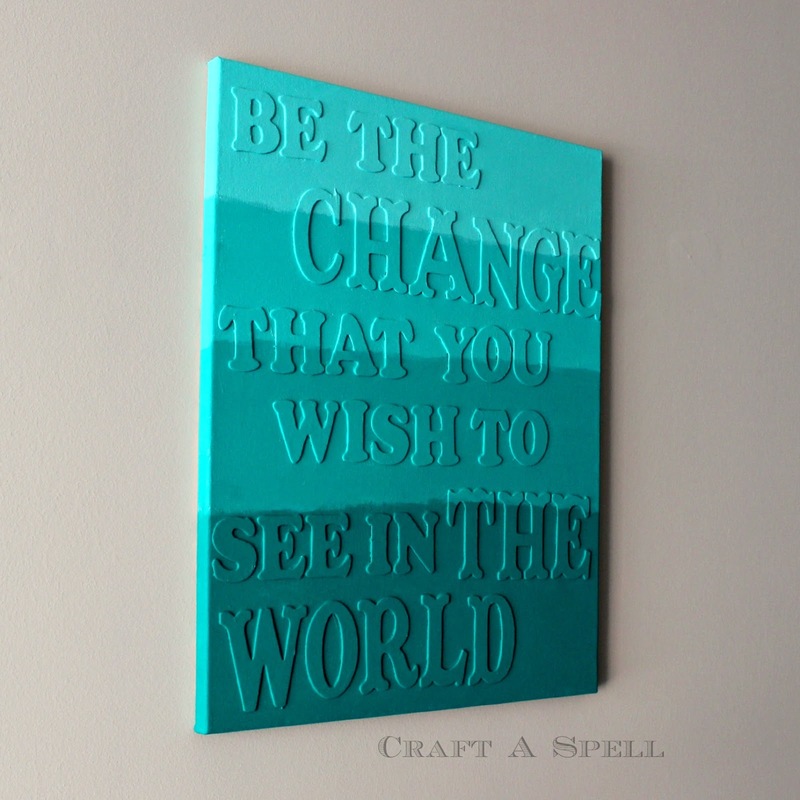 It's got one of my favorite quotes and my favorite colors and I just love the global aspect of it. Love it! And I especially love that you showed the entire process! I recently had this great idea in my head (uh oh) for a wreath and it was a colossal failure. So I took everything off and started over and I just love it now! I wish that I had been brave enough to share the craft fail that it started out as. Great job! It makes me happy to see other crafters fail (that sounds so mean haha) and know I'm not the only one so I'm always happy to share the process! I'm glad you like it. I love it!! I'm also glad you shared the whole process. There have been times where I've tried something that I thought would be great only to have it turned out horrible. The good thing is that we can always start over! Love the ombre look with the teal!! Great job!! Thanks - I love the teal too! Your Ombre looks Fab! Love it! I share my fails on my blog a lot, then go back and fix it so I like what I see too. Happens to me a LOT! haha! I love the ombre look, and I really love the color you picked! Really great idea! Pretty colors and a great message... nice work! I love the message too! I loooooooooove this! 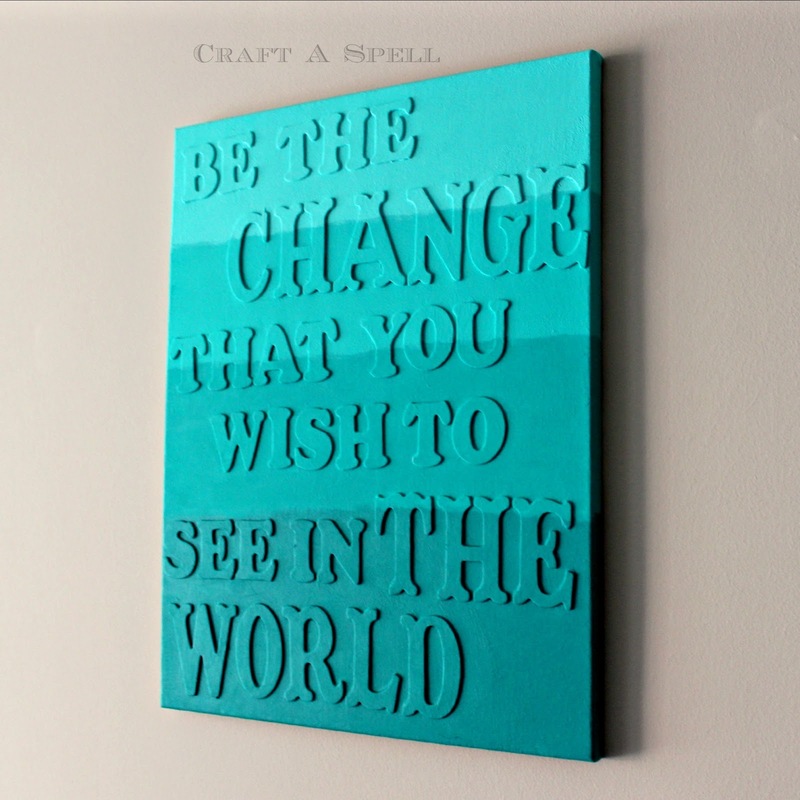 One I am obsessed with everything teal right now, and two I love this saying! Great job!